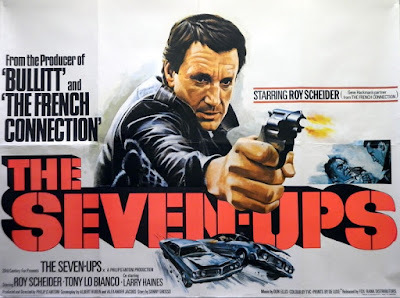 Like so many cop movies of its era, “The Seven-Ups” makes great hay from its grainy NYC locations, evident from moment one as Buddy Manucci (Roy Scheider) paces back and forth on a New York City sidewalk, always looking over his shoulder, as if waiting for someone or something. That sensation is furthered in how the camera switches between shots from street level and from up on high, like he’s being watched, and if you did not know going in that Buddy was a cop, loosely based on Scheider’s “French Connection” character, you’d be liable to confuse him for someone up to no good. That’s part of his undercover act, however, and it is soon revealed that he and his Seven-Ups plainclothes squad is busting a counterfeit ring, a sequence that director Philip D’Antoni plays less for suspense than roughhousing comedy, leaving you to think The Seven-Ups would smash the Crown Jewels to get the bad guy. You are hard pressed to tell the busted and those doing the busted apart, “The Seven-Ups” in capsule, where they are not so much in too deep, which suggests a breakdown in grasping right/wrong, as right-side up with a casually brazen disregard for institutional norms. This thin line between cops and robbers and is given added weight through the movie’s central relationship between Buddy and his informant, Vito Lucio (Tony Lo Bianco). Buddy might be using Vito for information, but he strikes a friendly tone, not from circumstances but from truth, Scheider’s very air cultivating the sensation they go back a ways. This proves the movie’s only relationship of consequence, much more so than Buddy and his Seven Ups, with the cop counseling that he’ll do whatever he can for Vito’s sick wife. And this makes it all the more troubling when it turns Vito is running a kidnapping scheme of mob men behind Buddy’s back, feigning incredulity when Buddy asks about it, all of which comes home to roost when one of Buddy’s Seven Ups winds up dead and his bosses try yanking him off the case. That’s standard cop movie stuff that eventually explodes into an iconic car chase scene easily rivaling its contemporaries like “French Connection” and “Bullitt.” Forgoing geographic logic, Buddy’s pursuing his partner’s two killers through the crowded streets of New York and then eventually onto a highway just outside the city manages to both leave you horror-struck by the disregard for civilian life, with not just the baddies but Buddy accelerating right through a gaggle of kids, and make you empathize with Buddy’s antagonists by virtue of constant close-ups of the villain in the passenger’s seat whose faces of nigh comical terror are so raw that you’re just going with your gut. And though you inherently know Buddy can’t perish at the end, when the end does come, involving a fork in the road and a tractor trailer, the crescendo is so explosive that your inherent sense of film cliché is nevertheless drowned out amid the terrifying shriek of metal. The sequence puts Buddy firmly on the same unethical ground as “The French Connection’s” Popeye Doyle though overall “The Seven-Ups” proves less interested in stressing these dubious motivations. That’s partially a difference in the actors. If Hackman excelled at simmering rage and resentment, Scheider exudes more cool control. In an early scene where he overhears his commanding officer being reamed out for “The Seven-Ups’” methods, Scheider has Buddy lean against the wall while listening, patiently waiting for the reaming to end. There is little challenge to his worldview, which is why the conclusion amounts to little more than revenge rather than toppling the bad guys, with Buddy eventually turning his back on Vito, a sequence which, in its own way, is not as abrupt as the conclusion to the car chase though no less emotionally intense, as cold as that wind must be blowing in off the Harlem River.